This years tree is courtesy of some manzanita branches from my parents yard. My roommate is very allergic to Christmas trees so I got creative. This little tree can’t fit all my ornaments but it was the perfect low stress solution for my decorating this year. The colorful star is from a Christmas trip to Mexico two years ago. 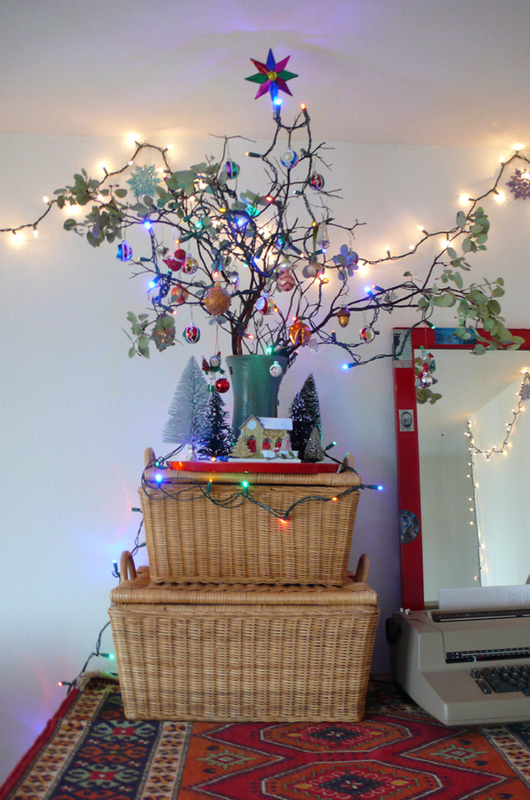 After I returned from Christmas I discovered my make-shift tree had taken a crash. Was it my cat? Was there a minor earthquake while I was away? I’ll never know. Luckily my mom wrapped a gift for me in a box topped with an extra sparkly bottle brush xmas tree. It saved my little arrangement so my living room can stay festive into the new year. Posted in Pretty trimmings/decor and tagged with Holiday, Christmas tree, Christmas, decorations. December 18, 2012 by Shasta Garcia.